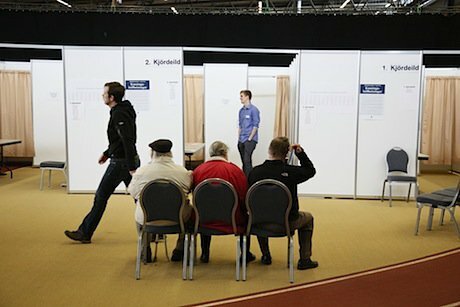 Icelanders vote in the 2013 election. Demotix/Eythor Arnason. All rights reserved. “The road ahead might be long and hard. But at least the road is open.” These were the last words of my previous article on democracy in Iceland - let’s take up the story from there. As early as the summer of 2009, those of us who were actively working for a sustainable and democratic society in Iceland started asking ourselves when the window of opportunity opened by the 'pots and pans revolution' would close. There is usually a period of greater opportunity for change in the aftermath of a crisis. This is mainly due to three factors: defaults of the current system are visible and obvious to all, the system and its ability to reproduce itself is weakened and, facing decreased opportunities to meet expected living standards, people are more willing to direct their resources/attention towards progressive movements. But as time goes by the system restores itself. In this case, it was salvaged by a left wing government which chose to restore rather than restructure the system – promising to change things once the crisis was resolved. As I have pointed out in my last article, many were highly sceptical of this approach, arguing that it would be far more difficult to change a restored rather than a broken system. Still the window of opportunity remained open - and is still open in many regards, especially in comparison to the state of affairs before the 2008 crisis. But as the system restores itself the window is slowly closing. The results of the last election will most probably lead to a right wing government which will rule out many opportunities, and speed up the restoration according to a neoliberal ideology of the markets. One of the few, and by far the most innovative and interesting attempts by the former left wing government to restructure the system was the Constitutional Council. Alas, although the basic idea - that the general public should be actively involved in creating a new constitution - was indubitably right, the implementation had many flaws that were soon exploited by those against this radical proposal. Ultimately, the attempt failed as Althingi (the Icelandic parliament) could not reach a majority to follow through the proposals of the Council - even though a referendum was held and a two-third majority of voters supported the Council's proposals. During the campaign leading to the referendum, many pressure groups were formed to defend the Council's constitutional draft. The same groups then pressured the government and parliament to ratify the proposals. In the political arena, new political parties were formed with the specific goal of making the parliament adopt the draft Constitution if elected, and members of the Constitutional Council sometimes even joined their ranks. But these parties did not get elected to the parliament. In contrast with the strong support that Icelandic voters showed for the constitution in the referendum, polls indicated that the constitutional issue ranked low on voters' priorities in the 2013 elections. But why didn't the previous parliament finish the process before the election? This can mostly be pinned down to excessive optimism on the part of the proponents of the constitutional experiment – there are many lessons to be learned here. The most important is that when you engage in a huge task such as a revision of the constitution, the whole process needs to be clear from the very beginning. Clearly stated and publicized. Back when the elections for the Constitutional Council were held, it was still unclear how the Council's proposals would be implemented. Would the parliament simply ratify them, or would political parties be allowed to revise the draft? Was there going to be a binding referendum, even only symbolically, as the constitution doesn’t allow for it? These issues, among others, were left pending when the process started. The consequence proved to be decreased legitimacy and trust in the whole process. There is little reason to hope that the Council's proposals will be implemented as the expected right wing government was generally against the process and the draft constitution. It would thus come as a major surprise if the proposals came back on the political agenda during this government's four year term. And that’s where we are at. The journey towards real democracy and sustainability is going to be long and difficult. And longer, more difficult than initially expected. Yet, the movement is not quite dead: grassroots organizations multiplied during the crisis and a lot of effort was put into many different activities. Some of these efforts focused on Icesave, others on feminism, the constitutional process etc. Many are still active and will keep fighting for years to come, while some will undoubtedly wither away. Numerous political parties were founded but only two, Bright Future and the Pirate Party, got members elected to the parliament. A lot of people put great effort into political projects that did not bear fruit in the last elections. That’s the lesson we’ve learned so far. The project of making our societies truly sustainable and democratic is a long term one. It’s going to take time, patience, organization and a lot of effort. For many it might seem that the window of opportunity was wasted and is now lost. I disagree. Some opportunities were wasted, of course, and many things could have been done differently for better results. But it was to be expected that in a period of anomie and crisis, any mitigating attempts would be slightly chaotic. This is another very important lesson. When the financial crisis hit, we weren’t prepared. Thatcher would have said there was no alternative – in our case, we didn’t have associations, let alone political parties, with adequate organization and a coherent policy and institutional model that could replace our current system, while ensuring sustainability, real democracy, greater equality and increased well-being for all. Considering this, at least we now have a task. A long-term task to introduce, support and press for a new institutional model. To polish and refine our ideas. It takes a long time to introduce new ideas into the general public, even though many of these ideas are themselves quite old. It also takes a long time to create associations and groups with the adequate organization to generate resources needed to mount a successful campaign. But never mind the time it takes, it is what we have to do.